Former United Auto Workers Vice President Norwood Jewell has pleaded guilty to violating federal labor law by misusing money meant for a worker training center. The government says Jewell was part of a wide-ranging, years-long conspiracy between Fiat-Chrysler and UAW officials to siphon funds from the automaker-supported training center. The FCA-UAW bargaining team in 2015, including Norwood Jewell (3rd from left). Norwood became a UAW vice president and head of the union’s Chrysler department in mid-2014. When he did so, the government says he entered a “culture of corruption” established by his predecessor, General Holiefield, along with former FCA Vice President Alphons Iacobelli and other union and FCA officials. The scheme involved FCA payments to a joint UAW-Chrysler worker training center. Both FCA and UAW officials inappropriately diverted those funds for their own use, the government says. Jewell pleaded guilty to using his training center credit card for thousands of dollars in meals at a California steakhouse, at a Palm Springs golf resort, and for travel and other expenses that should have been picked up by the UAW. He also allowed subordinates to make similar purchases with their credit cards. Jewell has steadfastly denied that the scheme, which the government says ended in 2016, influenced collective bargaining negotiations. 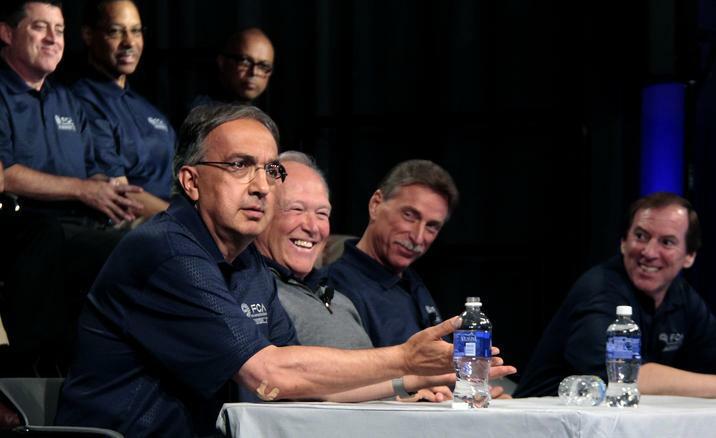 The UAW and FCA bargained a new contract in 2015, with one tentative agreement rejected by union workers before a final agreement was reached. The government will recommend a 15-month prison term when Jewell is sentenced in August. “It’s a sad day. The man is a legend,” Jewell’s attorney Michael Manley said Tuesday. Manley says there’s a difference between his client and others charged in the scheme, saying Jewell’s crimes were more along the lines of “technical violations” of the law. Detroit U.S. Attorney Matthew Schneider didn’t buy that argument. Jewell is the highest-ranking UAW official charged in the scheme so far. His predecessor Holiefield died in 2015, though Holiefield’s widow pleaded guilty to tax crimes as part of the scandal. Ex-UAW President Dennis Williams’ name has surfaced during the investigation, but he has not been charged. Delegates to the United Auto Workers' Special Convention on Wednesday completed voting on resolutions for the next four-year contract with automakers and other UAW-represented companies. The resolutions will guide union negotiators as they hammer out the terms of the deal. One resolution seeks to place more limits on automakers' use of temporary workers. UAW sues GM over three plant closures, or "unallocations"
The United Auto Workers union is suing General Motors over its decision late last year to "unallocate" three plants in the U.S., one of them the Warren Transmission Plant in Michigan. "Unallocate" means, according to GM, ending production of the plants' current products while not assigning new ones. The union says it's a code word for closing, which is prohibited under the current four year contract. Harley Shaiken is a labor expert at the University of California Berkeley. Detroit got some very good news on Tuesday. Fiat Chrysler says it plans to build a new assembly plant in Detroit, invest in five other Michigan plants, and hire 6,500 additional workers. Michelle Krebs is an analyst with Autotrader. "Detroit hasn't seen a new assembly plant in a long time, decades," says Krebs, "so this is absolutely fabulous news for Detroit, for Michigan and for Fiat Chrysler and Jeep." Fiat Chrysler says the nearly $4.5 billion expansion will help it meet growing demand for Jeep SUVs and RAM trucks.